Using a database is the only appropriate way to store large amount of data. As tablet and smartphone purchases are booming it stands to reason to have a look at some apps for iOS devices. 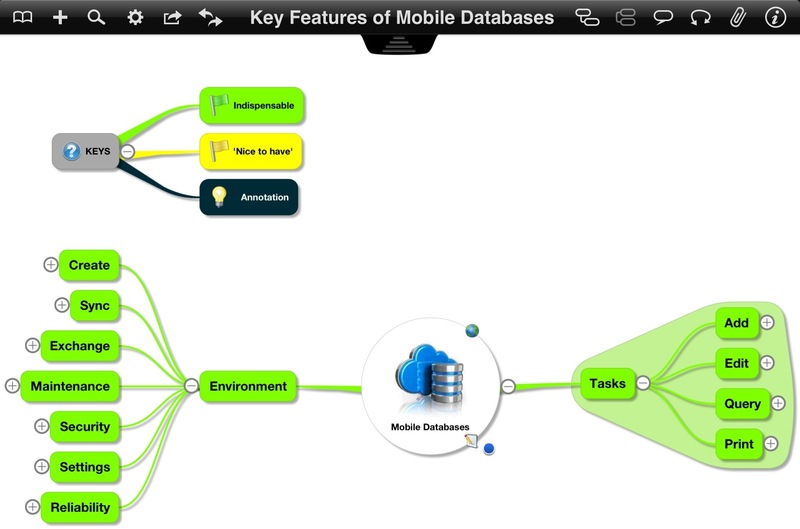 The replication of large databases or parts of them – large in the context of mobile, lightweight appliances, e.g. not more than 2 GB – is characterized by the cooperative use of the same data by numerous users. Data are mainly managed and manipulated by the DBMS on a stationary server, only a few or no changes are performed on the mobile device. Business applications, geographic information systems or multimedia are typical applications. The most important challenges for mobile databases in this field are syncing, performance, storage capacity, and the way to display data on a small screen. Due to the restrictions of CPU performance and storage capacities applications for mobile devices are suitable for about, let me say, 10,000 records. Larger amounts of data cause performance problems when it comes to import, export, and sync data with other devices. Stationary devices are customizable for the needs of their applications with a broad range of exchangeable hardware components. In contrast Apple’s mobile devices are not upgradable. So the later usage of the device has already to be considered when it’s purchased. Screen sizes like that of the iPad are not suitable for databases containing tables with a large amount of fields. Even in landscape mode it’s hard to view tables with many fields and different field types. Usually views of tables are not customizable by defining suitable forms, subforms for related tables, data sheets, and reports like it is possible e.g. in Microsoft Access. As we are talking about applications for the actual iOS devices the key feature list assumes an iPad and an iPhone as mobile devices optionally supported by a Mac as the big brother to do some tasks mobile devices are not designed for. 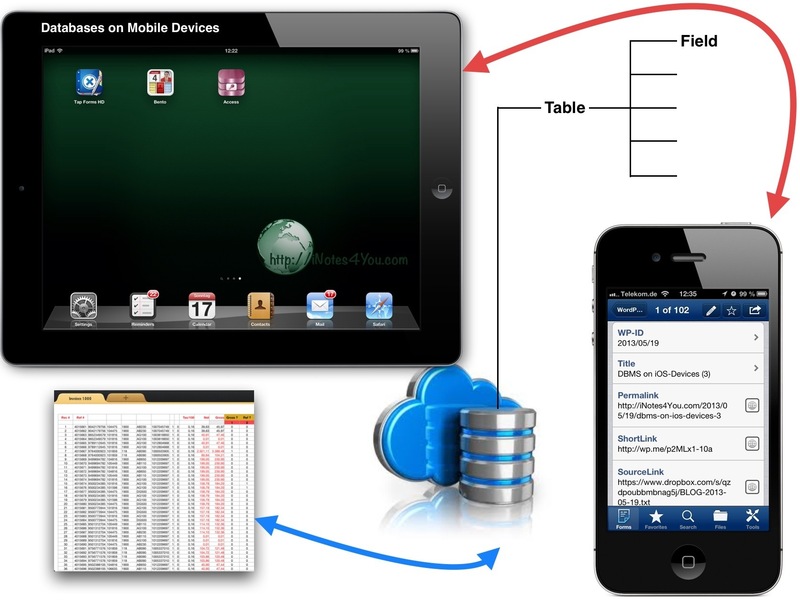 Here are some key features for apps managing databases on mobile devices. When expanding the branches of this map you will see many details reflecting my comprehensive experiences with database tools. an example is Microsoft Access Database Client, My SQL Mobile Database Client, (Impathic LLc. USA) and the mobile database clients for Microsoft SQL Server, MySQL, Oracle, Sybase, PostGreSQL, and DB2 also developed by Impathic. These solutions are not discussed here because of the dependency of an external data source managed on a webserver. I want to talk about an appropriate usage of databases on Apple’s iOS devices. So the focus is on private and small business applications, the usage of more than one device without the necessity of a stationary device, and the independency of external data sources. Please visit iNotes4You to read the upcoming article DBMS on iOS-Devices (4) with a description of the Mobile Microsoft Access Database Client by Impathic LLc, USA. This article will be published on May 22. Thanks a lot for visiting iNotes4You.